Much of the early history of the organ was printed in the Parish Magazine some years previous to 1892 and in October that year was reproduced in a supplement to the “Musical Standard”—‘The Organs of Great Britain number 45’. Next year 1.5d was paid “for halters for the organs”. This is not readily intelligible, for though they were send back to the organ builder for repair several times, this could hardly have been needed after a single year’s use. Possibly the halters were reused from another organ possibly a ‘portative organ’- a type which were common in the 12th Century and for the next three centuries. The Parish record shows “Item in mony by us received for the olde organnes solde into the countres by agreement”. In 1519, there is another reference to a charge for the repair of “olde organnes” sold presumably the year before. Possibly the purchase was not happy with what he had bought and demanded a repair which is recorded as costing 6s 8d and “Four porters for brynnyng home them got 8d between them”. There is no further record of the organ until 1549, there having been a gap in the church accounts during the period 1523 to 1549. However, it is recorded in 1549 that it “followed the plate and vestments, which were sacrificed at the time of the spoliation ‘Item received for the organs, X s’”. From 1557 to 1746 there is not mention in the records of an organ or organist. This is a considerable period of time but major events occurred in this period, The Reformation, Puritanism and the Commonwealth all of which had significant recorded effects on church music, organs and the playing of organs as well at writ. It is, therefore, reasonable to assume that St Margaret Pattens along with many churches throughout the country had no organ and all records for the early part of the period were lost when the church burnt down in the Great Fire of 1666 which started a short distance away. The record shows that in 1746 “during the incumbency of Dr Birch the present organ, as far as outward appearance goes, was set up”. The oak case is very imposing, embellished with carving of flowers, fruit and musical instruments. A curious feature is the reproduction of a portion of the hymn tune “Hanover”. It is evident the carver was not a musician and it would be impracticable to play”. The origin of the present instrument is somewhat obscure. A tradition ascribes it to Father Smith and it is possible that some of his work is incorporated in the organ and an opinion has been expressed that the diapasons pre-date the organ builder to whom the organ is most commonly attributed whose name was Thomas Griffin. He was not in factor an organ builder rather a contractor who contracted out the work to others being recorded as a barber by trade. It is thought that it seems likely that he obtained his instruments from Byfield, Jordan and Bridge. 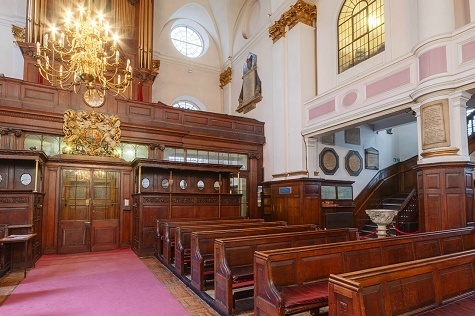 It is alleged that for the payment of an annuity he would provide an organ and organist and it is probable that around 1750 he provided this service to St Margaret Pattens Church. It is recorded that although Griffin had no musical qualifications or ability he was elected Gresham Professor of Music in 1762 and held that position until 1771 at the time of his death. There has been some discussion as to whether Griffin was really an organ builder, or an organist. 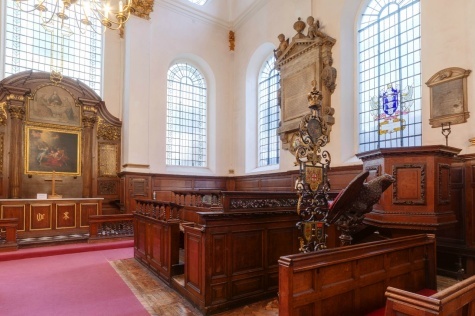 He was commissioned to build the organ at St Helen’s, Bishopsgate in the sum of  500. It is also said that he was appointed organist at St Helen’s, Bishopsgate in 1742 and continued in the post until his death, when he was buried in the church. However, in the agreement there was a clause saying that “he could play by deputy or by proxy”. SWELL	(3 stops) Open D. 32 pipes, Stop D. 32, Trumpet 32. Three composition pedals in each section. This scheme did not materialise but in August 1911 Messrs Foster and Andrews added a pedal bourdon at a cost of  45. This was the only pneumatic part of the whole organ, the rest being action tracker. In October/November 1945 Messrs J W Walker repaired pipe work and case following enemy action. In November 1946 a “Discus” blower was provided and added by the same firm, this being induced by the fact that the organist was frequently “let down” by his blower! At the same time the tuning contract and care of the organ was transferred from Walkers to Messrs Rushworth & Dreaper. About this time the Swell Double was not working properly in as far as the mechanism controlling the lowest octave, which is outside the Swell Box, was out of order but this was subsequently corrected. In January 1954 a scheme was drawn up in consultation with Messrs Rushworth & Dreaper for a thorough clean and overhaul of the organ together with some tonal additions and mechanical improvements. To overcome the lack of a soft accompanimental stop it was proposed to add a Dulciana 8 feet. This could not be provided without sacrificing an existing stop. The Gamba could have made room for the Dulciana but it was felt that the loss of this fine stop would not compensate the gain of the new register An alternative was to remove the 3-rank Mixture, this giving room on the soundboard for the Dulciana but decapitation of the diapason chorus would have resulted. With the retention of the Gamba a Tenor C stop, consideration was given to adding a new bottom octave, then a downward extension of a further octave thus giving a Violone 16 foot and a Violone 8 foot on the pedal. A Tremulant, Super Octave and Unison off couplers were also contemplated. With the Swell Double available on the pedal, an Acoustic Bass 32 foot could have been provided from it and the Bourdon 16 foot. As an alternative a 16 foot reed was suggested. The Great Gamba, with new bottom octave and downward extension a further octave would have enabled Violone 16 foot and 8 foot to be added to the pedal. Bourdon 16 foot and Open Diapason 16 foot to each be extended to 8 foot pitch. 5 to Great, 5 to Swell. Reversibles to Great to Pedal, Swell to Pedal, Swell to Great. A compromise was reached with the Gamba, by skilful revoicing, with the result that it is now a beautiful solo voice and it functions also as a soft accompanimental stop. The Tenor C compass does occasionally restrict performance of any low writing for the left hand. The Double Diapason has been made available on the Pedal Organ as a very soft 16 foot register. The Bourdon has the common fault of being a little too strong for very soft manual work but the derivation of the Swell Double has resulted in an excellent 16 foot bass for this purpose. Consideration was given to a further extension to 8 foot but cost precluded this. The Bordon 16 foot and Open Diapason 16 foot have both been extended to 8 foot pitch to overcome the lack of 8 foot pitch in the Pedal department. It is interesting to note that in 1856 Holdich added the first Pedal Pipes and in 1956 the pedal has again received attention so that just one hundred years afterwards this important department now more closely approaches what it should be in relation to the manual tonal structure. New Radiating and Concave R.C.O.- pattern Pedal Board. “Great to Pedal” reversible pedal on left-hand side of the penal board It is the interesting to note that the organ, prior to the rebuild, was one of the few which only had the actual drawstop and no duplicating manual or pedal device for this much used coupler. Opportunity was taken to alter the settings of the composition pedals, which incidentally, were renewed and sited so as to be clear of the balanced swell pedal placed over the centre of the pedal board. Straight stop jambs—Swell, Pedal Gedeckt and Couplers on Left, Great and Pedal on Right. Wind pressure 3.5” throughout Pitch c = 528 @ 60 degrees F.
The case-work was thoroughly cleaned revealing the full beauty of the carving and display pies were re-gilded. In July 1955, work commenced on the restoration of the Church and this was completed in the spring of 1956. During the work the organ was suitably protected until the work of reconstruction could commence. Thus the organ was silent from July 1955 to June 1956 when it was brought back into use.